Today I'm very glad to announce my newest house music track called Casa Grande is out to download now. This tribal tech house latino infused beauty was featured on The Rezonation Music WMC 2013 sampler which received massive support from some of the worlds top DJs including: Rio Dela Duna, Stonebridge, Oliver Lang... ( the list of top DJs could go on and on)! I'm very proud to announce my collaboration with the ridiculously talented Reza (Rezonation Music head honcho) on this summer terrace track. 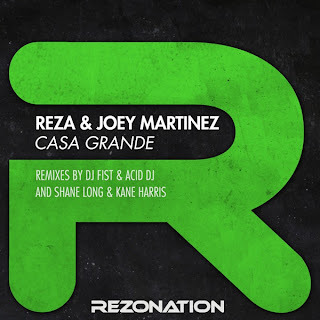 Casa Grande has been remixed by the top guys: DJ Fist & Acid DJ, Shane Long & Kane Harris. They have certainly worked their magic and help to create a release that I am really proud of. This techy number will surely be slammin' the terraces around Ibiza 2013. Long & Kane Harris this looks set to be a certain summer smash!"